Every year right after Christmas, we celebrate the feast of the Holy Family. There is an important reason for this. It’s easy to think the “incarnation” means God took on a human body, that he appeared in human flesh. But there is much more to it than that. In Jesus, God unites himself to an entire human nature. He fully enters into human experience, with all its peaks and valleys. And a part of that human experience, with more than its share of peaks and valleys, is family. Jesus spent over 90% of his years in the obscure, nitty-gritty of family life. Though only a few chapters of Scripture are devoted to this lengthy period, what they reveal is significant. First of all, despite the cuddly image of our nativity scenes, the original nativity was anything but cozy. A woman nine month’s pregnant rides 75 miles on the back of a donkey over bumpy, dusty roads, so she can have her baby in a stable full of animals. Stuffed lambs may be soft and cute; real sheep are dirty and smelly. Quickly after the birth they have to pick up and flee for their lives seeking asylum in a foreign land where they have no support from friends or family. A few years after their return to their homeland, their adolescent son goes missing for several days, and there ensues an emotional conversation. Joseph is a saint, Mary is without sin, Jesus is God incarnate, yet there are still challenges, difficulties, tense moments, and opportunities for misunderstanding. Welcome to real family life. All things created by God are good, with human beings and human life very good according to Genesis 1. Yet in assuming a human body, the Divine Word elevated its dignity, sanctifying it and ennobling it. In accepting baptism from his cousin John, Jesus sanctified water and, in baptism, made it an instrument of his sanctifying power. In entering into family life, Jesus does the same. The family, up till now naturally good, becomes an instrument of sanctification. As a teen, I assumed that a serious pursuit of holiness meant opting out of marriage and family to enter a monastery. Holiness was about lots of quiet prayer and apostolic work. The noisy, everyday life of family was a distraction from all this. The role of married folks was to merely get to Mass on Sunday, obey the 10 commandments, and get into heaven. 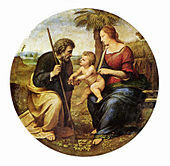 The feast of the Holy Family shows how far off-base I was. It reminds us that all human beings are called to the heights of holiness. That all states in life — including student, teenager, and parent — offer abundant opportunities to grow in faith, hope, and love. That the nitty-gritty of family life, if approached right, can be the road to profound personal transformation and communion with God. Think about it. The creator of the universe spent most of his human life as a craftsman, working with dad in the family business and ultimately taking it over. Mary, the holiest and greatest of all creatures, spent most of her time changing diapers, cooking, and cleaning. The secret to holiness is not to do extraordinary things, but to do ordinary things with extraordinary love (Col 3:15-17). The word seminary means “seedbed.” It is a greenhouse where, in a sheltered environment, vocations can sprout and develop so they can be ready not only to survive in the real world, but to bear fruit there. The family is the original seminary. In the family is sown the vocation to share in both Christ’s holiness and his mission. Ironically, tending to these seedlings causes the parent/gardeners to grow as well. So family, in God’s plan, is a community where everyone grows and becomes more fruitful. The bottom line is this–we don’t become holy despite the busyness of family life, but in and through it.